Along with this, other companies may boast of the thickness of their aluminum, as a selling point of their products, but when they use a lower-grade alloy that also is inadequately tempered, the result is a less rigid product. For this reasons and others, STOP Signs and More uses 5052-H38 aluminum and for signs under 29 inches in horizontal measurement length a .063-inch thickness. In signs that are 30 inches and over in horizontal measurement length, we use a .080-inch thickness. While competitors can tout their signs are .080-inch thickness, if they manufacture these signs in the lower strength 3003-H14 aluminum, the signs will most likely be inferior to those of STOP Signs and More signs that are of 5052-H38 aluminum in a .063-inch thickness. The following brief explanation describes the differences between the two types of aluminum mentioned in the above information. The aluminum temper designation such as H32 or H38 is important, as it is the hardness of the aluminum. Some companies may use the 5052 but with the H32 temper designation, which is only a quarter harder than that of STOP Signs and More's H38 temper. Temper designations of the aluminum alloys consist of suffixes that include their numeric alloy designations. One example of this is the 3003-H14 with the 3003 denoting the alloy and the 'H14' denoting the degree of hardness or temper. Temper designations also reveal the method used to achieve the hardness. There is a difference between temper designations in heat-treatable and non-heat treatable alloys and we offer the meanings to those of the non-heat treatable ones in the next section. Obviously, consumers are not able to access the use of professional testing equipment to learn if the aluminum they purchase is top quality, but they can learn the difference between various alloys by simply bending a corner with their hands. STOP Signs and More's 5052-H38 .063 will be quite difficult to bend unlike the 3003 .080, which will be easier to bend. 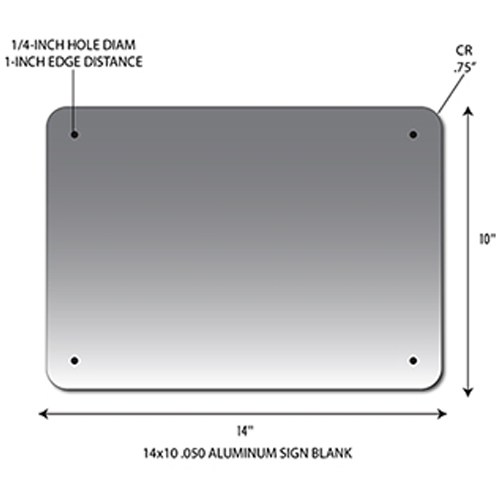 STOP Signs and More provides a wide assortment of aluminum blanks in 5052-H38 in .063-inch thickness. The blanks come in various stock sizes along with custom ones. You can also request a different thickness such as .080 or .125 inches. Another option that we offer is the 6016-T6 aluminum when the need calls for it.